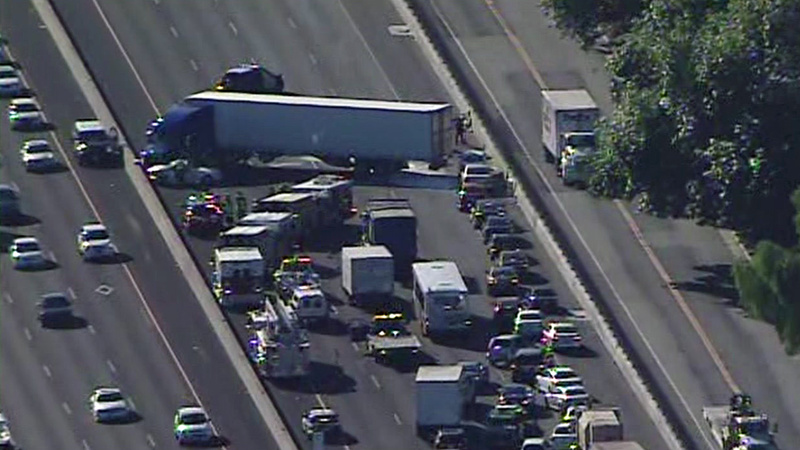 SAN JOSE -- Lanes have reopened on Interstate Highway 880 in San Jose where a big-rig was involved in a collision with multiple cars this morning, according to the California Highway Patrol. The collision occurred on southbound Highway 880 just north of Brokaw Road around 8:30 a.m., CHP officials said. A witness reported the big-rig hit cars, spun out and struck other vehicles, according to the CHP. The collision left the big-rig across all lanes of traffic, CHP officials said. A Sig-alert was issued at 8:47 a.m. closing all southbound lanes until about 10:15 a.m., according to the CHP. Also on I-880, a motorcyclist was killed in a crash with three cars in Milpitas this morning. At about 8:50 a.m., officers responded to a report of a collision between the motorcycle and cars on southbound Highway 880 just north of state Highway 237, CHP officials said. A Sig-alert was issued at 9:34 a.m. closing two southbound lanes, according to the CHP. There is no estimated time of when the lanes will reopen. The Santa Clara County medical examiner's office has been called to the scene, according to the CHP.